"Malware" is the general term for a group of malicious programs like viruses, Trojans, adware, ransomware, spyware, worms, and other malicious programs that affects digital devices like computers and smartphones. Malware is a malicious software which you didn't intend to have on your computer system. As with human diseases, symptoms of malware may or may not be visible to an average user. But malware can slow down your computer, steal your private banking information and passwords, distribute spam, attack other computers in the same network, or wreak havoc on your machine while spreading to devices. How Does Malware Get On To Your Computer? Malware can enter your computer via fake web sites that are specially designed to exploit security flaws (aka bugs) in your computer browsers. It can be inadvertently downloaded on your system when you download seemingly good software from such shady websites. It can also infect your computer via malicious email attachments, or a deceptive weblink. If your computer has malware, you have probably fallen for some type of internet scam. Hackers can use malware for activities like cyber-vandalism, cyber espionage, hacktivism, cyber warfare and various other reasons. 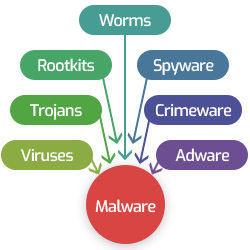 The term "Malware" refers to viruses, Trojans, worms, bots, adware, ransomware, etc. The overwhelming majority of malware programs are created to make money illegally, often by stealing sensitive and confidential information from victims' computers and mobile devices. Malware can do a lot of things such as stealing the sensitive data stored on your computer, giving hackers access to your computer, financial and personal information, holding your computer system as a hostage and demanding money, secretly gathering sensitive information about your internet activity and keystrokes, etc. From stealing private information to disrupting computer operations, damages caused by malware were manifold. How to Protect Your Devices Against Malware? The best way to protect your system or other devices from malware is to keep your operating system clean and up-to-date by downloading regular security patches and updates. It is advisable to have a reputable antivirus program installed on your computer. For businesses, we need a security solution that provides all-around protection to all devices including mobile devices. Comodo Advanced Endpoint Protection (AEP) is such a solution that can take care of all your endpoints. Comodo AEP can quickly identify and eliminate malicious software across endpoints. With Comodo AEP, securing your Android, iOS, Linux, and Windows-based endpoint devices will be a breeze. Try Comodo Advanced Endpoint Protection today!